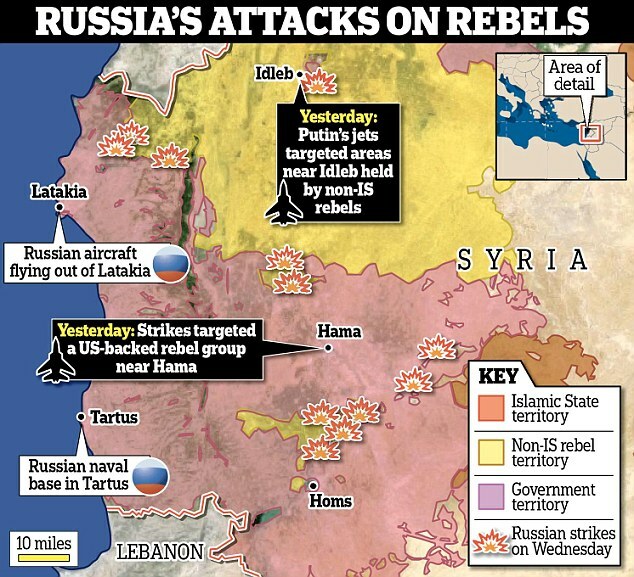 Vladimir Putin has conscripted 150,000 new troops into the Russian army as the country unleashed a new wave of airstrikes in Syria – while and Iran and Islamist group Hezbollah prepare for a major ground offensive. Hundreds of Iranian troops have arrived in Syria over the last ten days, backed by the country’s Lebanese allies, Hezbollah, and rebel fighters from Iraq and Afghanistan, two Lebanese sources claimed today. They are being supported by Russia’s warplanes who bombed camps of rebel fighters trained by the CIA, one of the group’s commanders claimed. White House spokesman Josh Earnest said Russia’s airstrikes in Syria were ‘indiscriminate’ and risked prolonging the conflict ‘indefinitely’. He claimed Russia’s ‘random’ strikes on Syria’s enemies would draw the country deeper into the conflict. A spokesman for Russian President Vladimir Putin claimed the decree to conscript hundreds of thousands of new troops was not related to the escalating conflict in the Middle East. 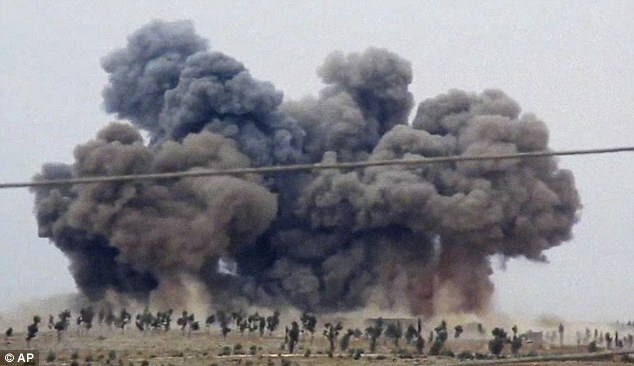 It came as Moscow claimed to have attacked 12 ISIS targets including a command centre in Hama and ammunition depots in Idlib on the second day of the aerial campaign. The area targeted is largely made up of rebel insurgents which, unlike Islamic State, are supported by United States allies such as the Arab states and Turkey. 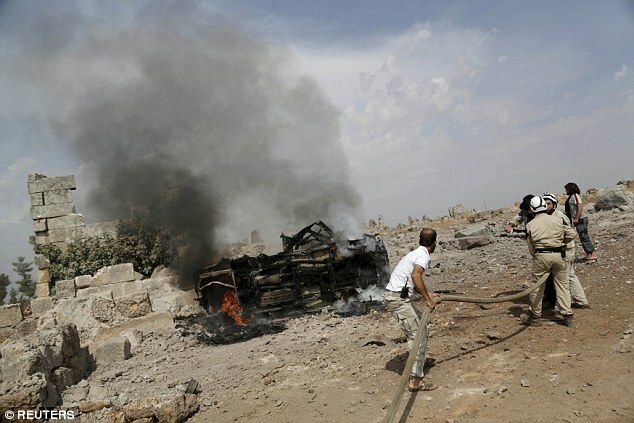 A Syrian security source said bombs were dropped on a coalition of Islamist rebels including Al-Qaeda’s Syrian branch, the so-called Army of Conquest which fiercely opposes ISIS. His fighters were trained by the CIA in Qatar and Saudi Arabia as part of a programme Washington said was aimed at supporting groups that oppose ISIS and President Assad. But Syria’s ambassador to Moscow, Riyad Hadded, claimed the strikes were ‘carried out exclusively against the positions of ISIS’. Meanwhile Russia’s Foreign Minister Sergei Lavrov has challenged the United States to prove that Russia’s operation was not targeting ‘terrorists’. 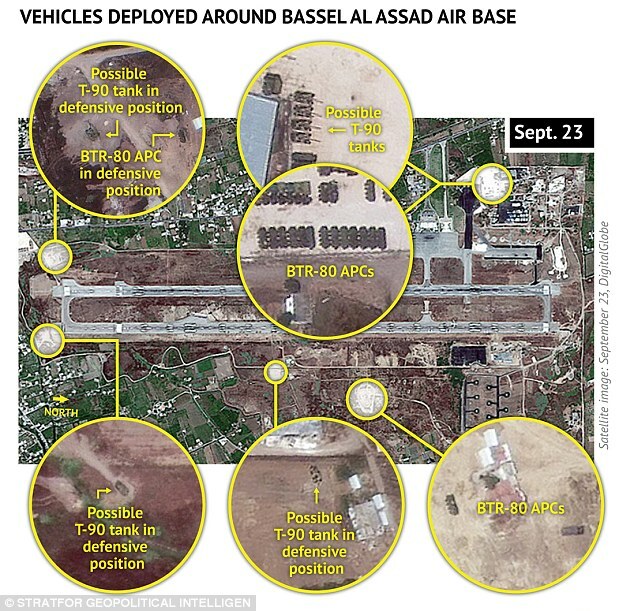 Today, Russia admitted the list of bombing targets were drawn up by the Syrian Defence Ministry, while it also used its own military satellites to obtain ‘intelligence’ to pinpoint targets . Moscow acknowledged it had moved marines to the war-torn country as the West fears more land forces are on the way. Putin denied allegations that his pilots left a trail of death among civilians, claiming this was ‘information warfare’ by the West. 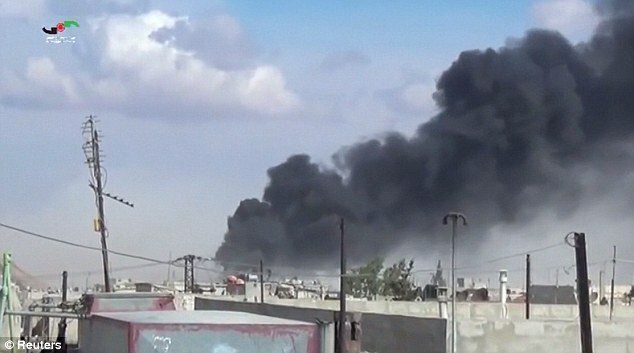 French President Francois Hollande said today that air strikes in Syria should only target ISIS, not other groups. 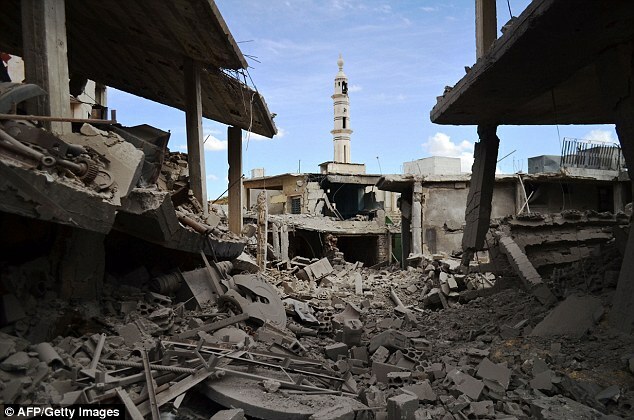 However, the Army of Conquest, which controls Idlib province, said on Twitter that ‘Russian pigs’ had flattened a mosque in Jisr al-Shughur. 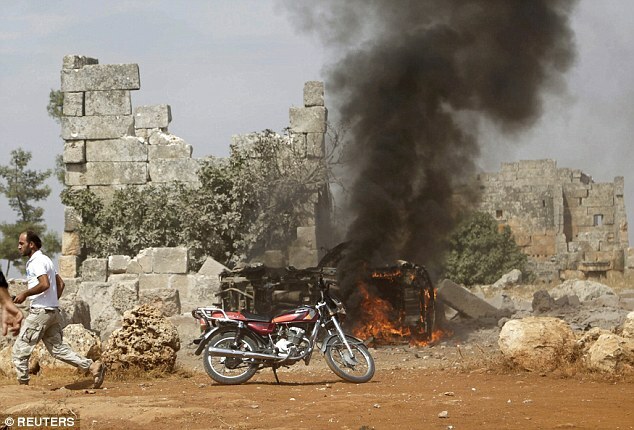 The British-based Syrian Observatory for Human Rights also joined the condemnation of Russian attacks by reporting US-backed rebel group Tajamu Alezzah was hit today and on Wednesday. 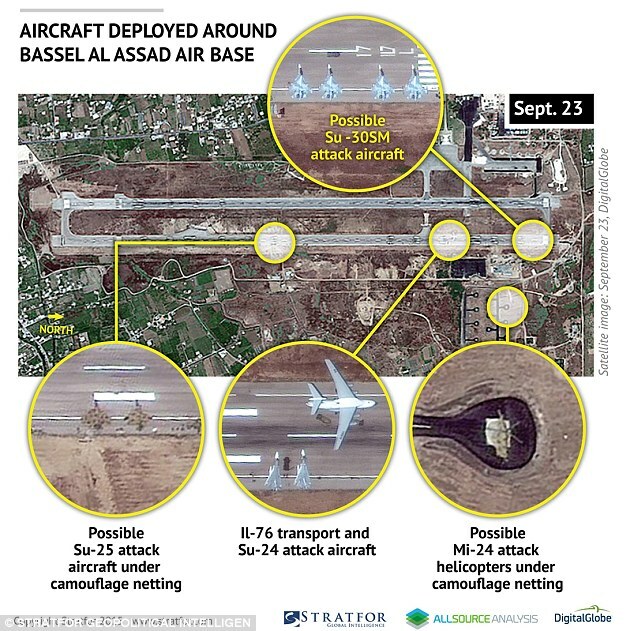 The conflict could escalate even more with the arrival of hundreds of Iranian troops, who have arrived in Syria to join a major ground offensive on behalf of President Bashar al-Assad’s government. They are backed by Assad’s Lebanese Islamist group Hezbollah and by Shi’ite fighters from Iraq and Afghanistan, while the Russians would provide air support. Hollande will discuss the crisis with Putin on the sidelines of the Normandy Quartet meeting tomorrow, a source in the Palace of Elysee told Sputnik News. Putin and Hollande will discuss the current situation in Syria, as well as bilateral relations between Paris and Moscow. 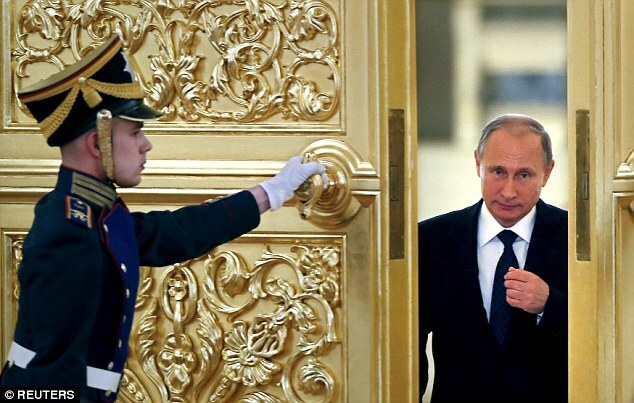 German Chancellor Angela Merkel is also expected to hold bilateral talks with Putin the same day. 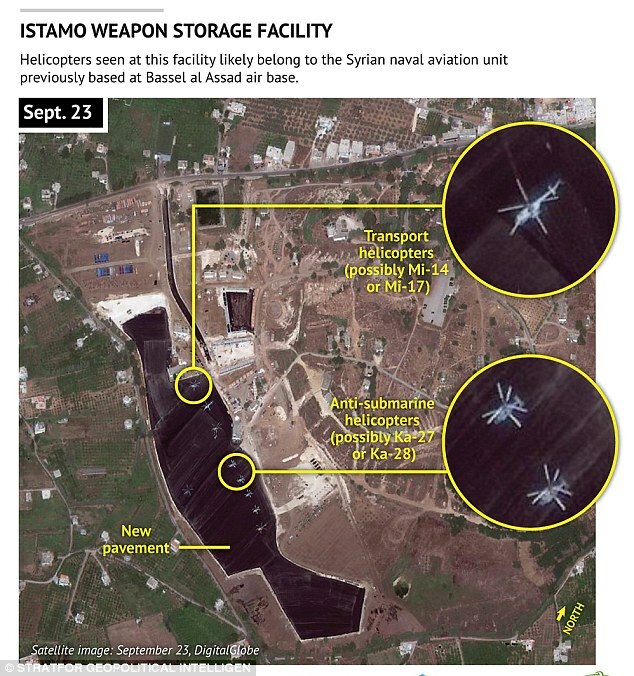 A picture emerged today purporting to show heavy Russian military equipment in desert camouflage being sent from the country’s southern Novorossiysk port to Syria. 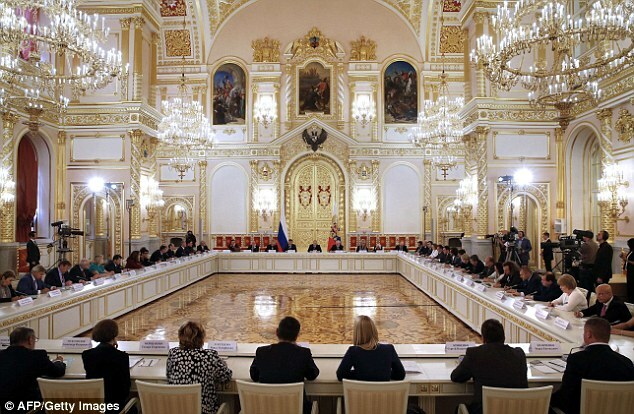 The image may suggest Russia could be involved in significant land operations. 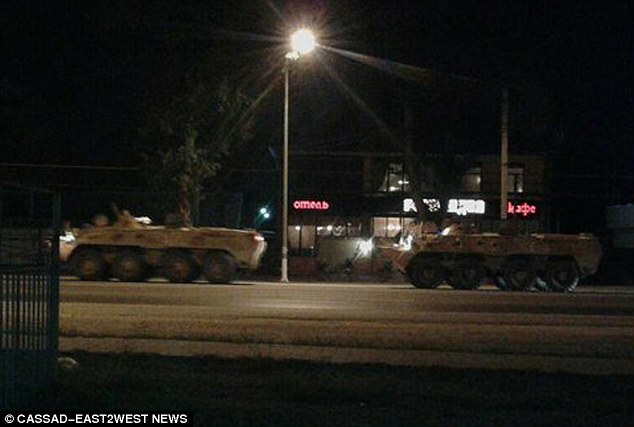 Patriotic Russian blogger Boris Rozhin said the armour shown on this picture was spotted moving through Krasnodar region towards Novorossiysk, a key Black Sea port. ‘The column is rather big and consists only of new and modern machines – 10 KamAZ-43269 ‘Vystrel’ (BMP-97), about 20 BTR-82, 4 BTR-80, 5 armoured Ural and 1 armoured staff-carrier,’ he wrote. ‘According to the direction, the column was moving towards the port, to be loaded on cargo ships. Earlier, one of Vladimir Putin‘s closest allies has called on the Russian president to deploy Muslim ground troops to defeat the Islamic State. 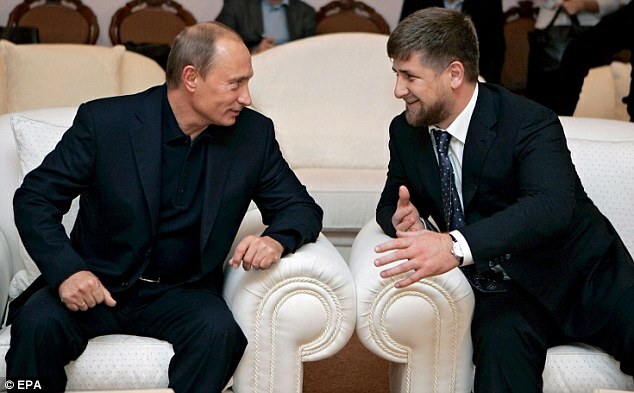 Ramzan Kadyrov, the strongman president of Chechnya, said Moscow should expand its operations in Syria – which began yesterday with controversial airstrikes on anti-government rebels in defiance of the West. He said: ‘I’m convinced that not only airborne should be used there, but also infantry, because the faster we finish off ISIS, the more peacefully we’ll live across the territory of global community. 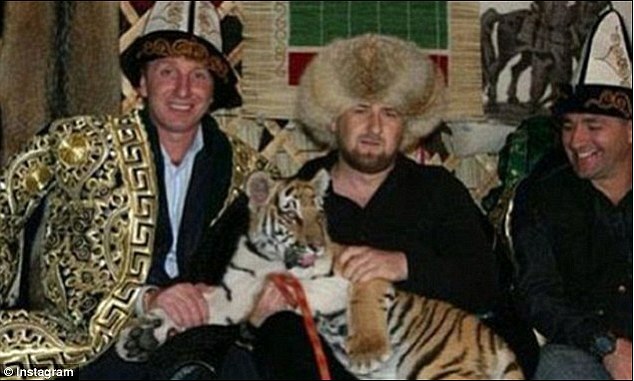 Kadryov, a Sunni Muslim who runs the province with an iron fist and is seen as one of Putin’s most loyal supporters, said Islamic fighters from Chechnya should be sent to combat the jihadis. 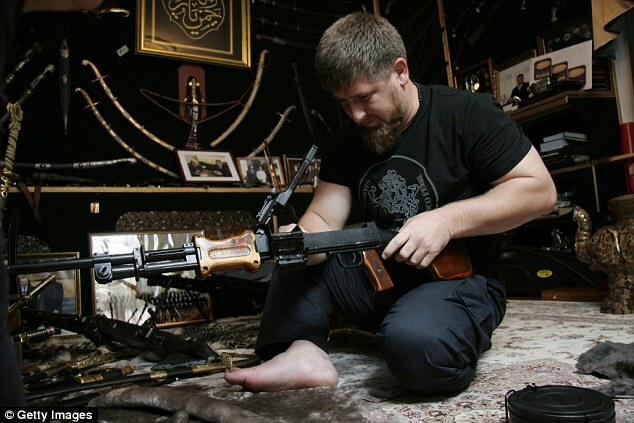 The Caucuses region of southern Russia – which includes Chechnya, Daghestan and Ingushetia – has become a hotbed of Islamist extremism in recent years and in the summer a major terror group with 15,000 fighters in the region pledged allegiance to ISIS. 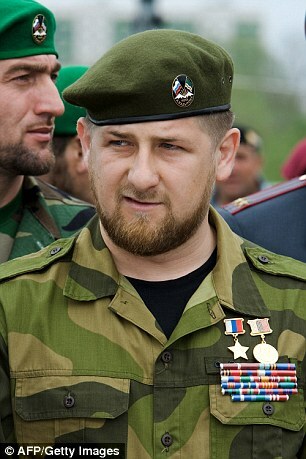 Kadyrov’s comments will be seen as an attempt to defuse further jihadi recruitment by negating the argument that the conflict is fuelled by sectarianism. That has also been the prevailing factor behind the West’s refusal to put ‘boots on the ground’ in Iraq or Syria, instead choosing to support Muslim troops in combatting ISIS themselves. Deploying ground troops, however, would plunge relations with the West into further crisis, but so far Putin has ruled out such a move, acutely aware of the Soviet Union’s disastrous decade-long presence in Afghanistan. Speaking to news outlet gazeta.ru, Kadyrov also claimed Putin had acted in line with international law in contrast to Western action in Syria. 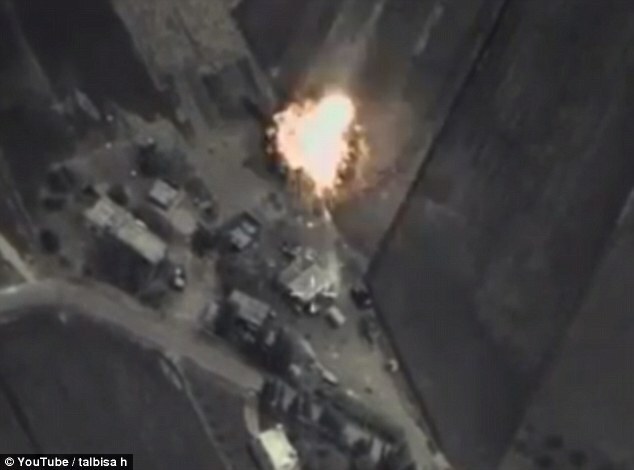 Russia’s UK embassy has taunted Britain over claims it is conducting an apparently ‘illegitimate’ campaign in Syria. In a tweet to Foreign Secretary Philip Hammond from its official account , it said: ‘Russian actions in Syria are legitimate by international law, unlike those of others. The message refers to a request made by Syrian President Bashar Al Assad for support against rebel groups in its four-year civil war. ‘I’m sure that it will contribute to ensuring safety in entire world,’ he added. His comments come after Russia was accused of ‘pouring gasoline on the fire’ of Syria’s civil war after it defied the West to drop bombs over the war-torn state. 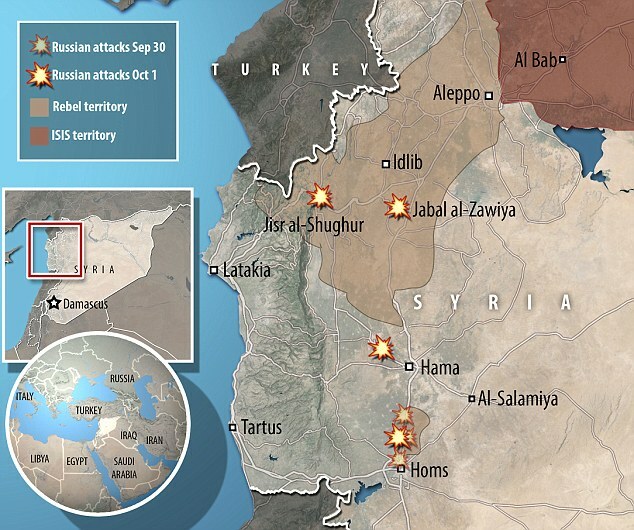 More than 20 Russian fighter jets attacked three provinces yesterday after the U.S. was given just one hours’ notice to remove its planes and officials from the area. The move increased tensions between the two countries after the Washington accused Moscow of only targeting areas held by moderate rebels rather than the Islamic State. 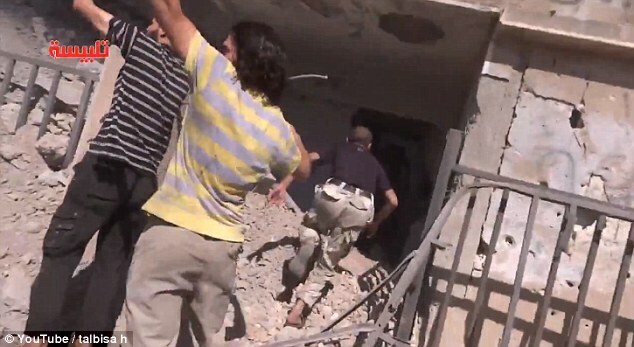 Syrian opposition chief Khaled Khoja said 36 civilians had been killed in the attacks, which also apparently targeted a CIA-vetted Syrian rebel group that was receiving U.S. missiles. 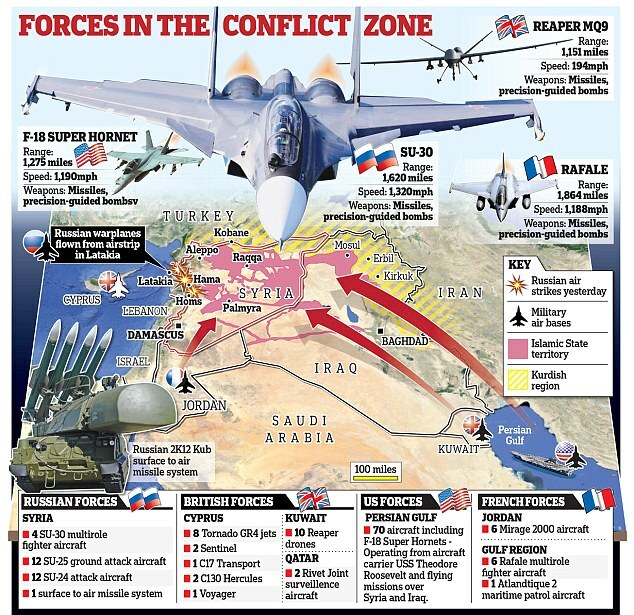 The Russian defence ministry said it carried out 20 flight missions and hit eight ISIS targets. Lavrov said the Russian military only went after ‘terrorist groups’ and said that Moscow had requested that American officials back up their accusations with firm evidence. Speaking to journalists on the sidelines of the U.N. General Assembly, he said the Russian Air Forces were co-operating with the Syrian pro-government military to target ‘exclusively’ ISIS targets. He said he had ‘no data’ on civilian casualties. U.S. Defence Secretary Ash Carter yesterday said Moscow’s entry into the bloody conflict was akin to ‘pouring gasoline on the fire’. 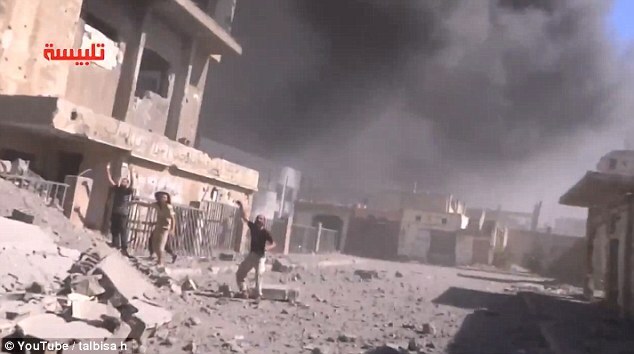 The coalition forces are fighting to defeat IS and oust Assad. 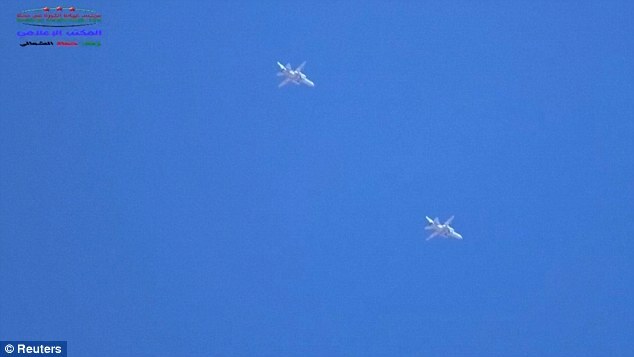 Coalition forces are in Turkey and Jordan training moderate Syrian rebels. 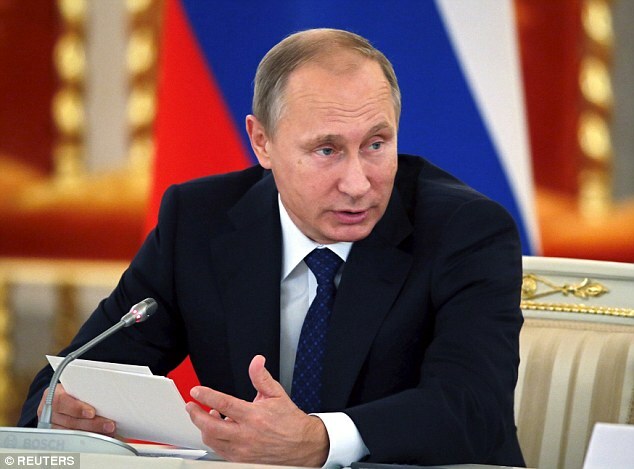 Vladimir Putin says Russia is attacking IS and supporting Assad. 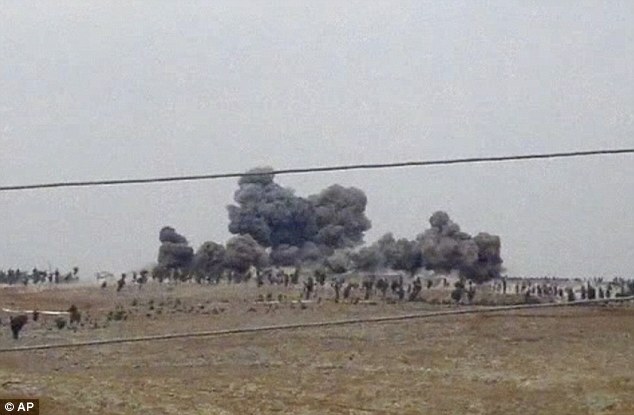 Evidence suggests it is attacking non-IS rebels. 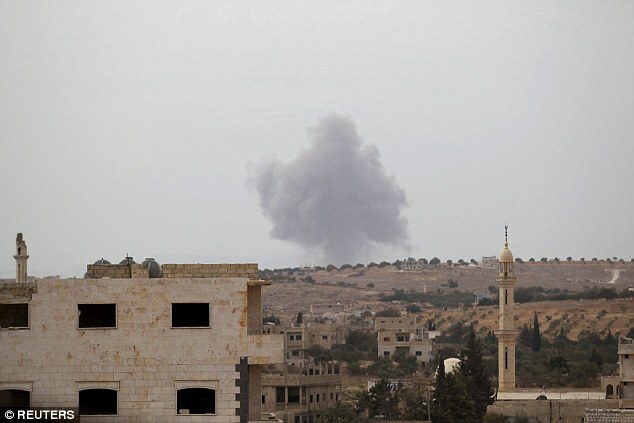 Iranian troops are to join government forces and Hezbollah in a ground offensive backed by Russian air strikes. Iran wants to defeat IS and prop up Assad. U.S. Secretary of State John Kerry said Washington was prepared to welcome Russian military action in Syria as long as it is directed against ISIS and other Al Qaeda affiliates, but would have ‘grave concerns’ if it conducted strikes against other groups. The U.S. and Russia both agree on the need to fight the Islamic State but not about what to do with Assad. The Syrian civil war, which grew out of an uprising against Assad, has killed more than 250,000 people since March 2011 and sent millions of refugees fleeing to other countries in the Middle East and Europe. Russia and United States agreed to call urgent military talks to head off the risk of clashes between their forces after Moscow’s dramatic entrance into the Syrian war. Senior U.S. officials expressed alarm after Russian warplanes began their first military engagement outside the former Soviet Union since the occupation of Afghanistan in 1979. The Americans accused Russia of striking moderate rebel factions fighting Bashar al-Assad’s Syrian regime under cover of their claimed assault on the Islamic State group. And they complained the U.S-led coalition already fighting its own air war against the jihadists had only been given a heads-up by a Russian general in Baghdad one hour before bombing began. 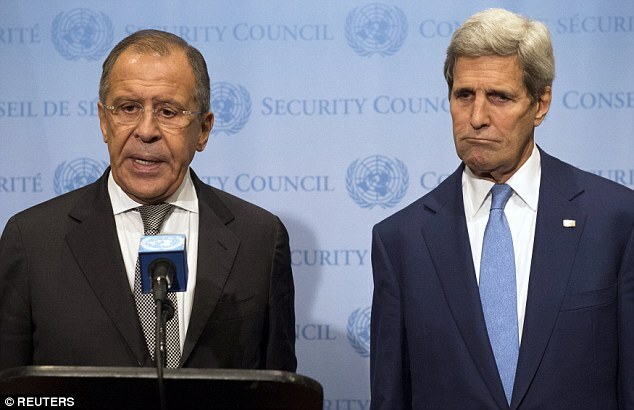 But, after sharp public comments in Washington and the United Nations, U.S. Secretary of State John Kerry and his Russian opposite number Sergei Lavrov put a brave face on the dispute. Appearing together on the sidelines of the UN General Assembly in New York, they said they would hold ‘de-confliction’ talks and had drawn up proposals to relaunch a Syrian political peace process. ‘We agreed on the imperative of as soon as possible – perhaps even as soon as tomorrow, but as soon as possible – having a military to military de-confliction discussion,’ Kerry said. Lavrov agreed their talks had been useful and both men said they would take their ideas for the political process back to their respective presidents, Russia’s Vladimir Putin and the U.S’s Barack Obama. But the narrow agreement to seek a mechanism to avoid accidental encounters between Russian and U.S.-led forces could not disguise the deep divisions Moscow’s actions had revealed. Both Moscow and Damascus presented the operation as targeting Islamic State militants, an idea disputed by U.S. officials. And he warned that Russia’s arrival in the bloody four-year-long civil war would ‘backfire’ and only serve to prolong the conflict. Kerry told the United Nations Security Council that there would be ‘grave concern’ in Washington if it turned out the targets were opposition fighter and not ISIS or Al-Qaeda, as claimed. 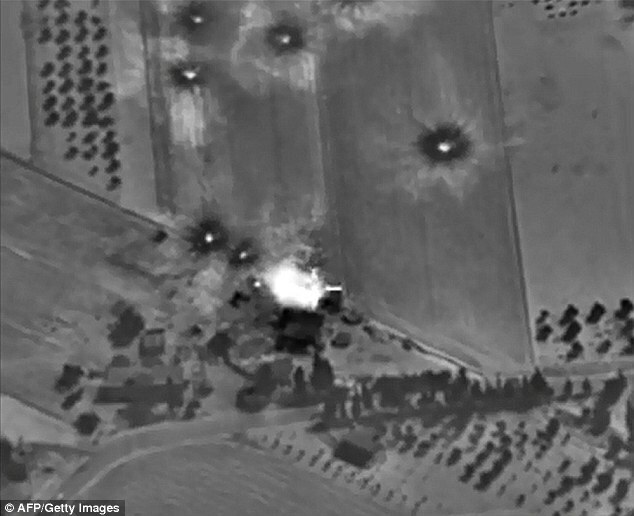 France, which on Sunday launched its first air strike against ISIS in Syria, also raised doubts over Russia’s objectives, echoing concerns that Moscow’s aims simply to keep Assad in power. 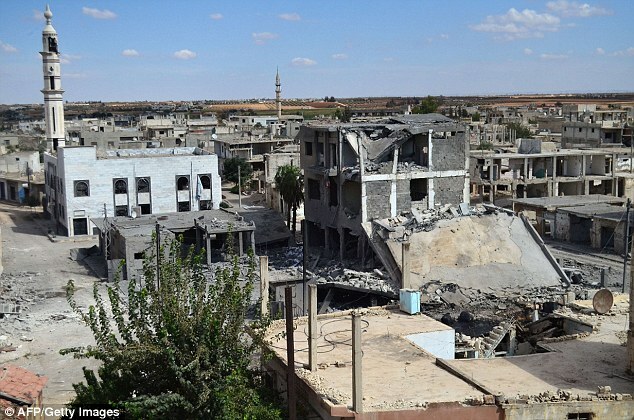 But the head of Syria’s main opposition group told AFP that one bombing run killed 36 civilians – including five children – in central Homs province. 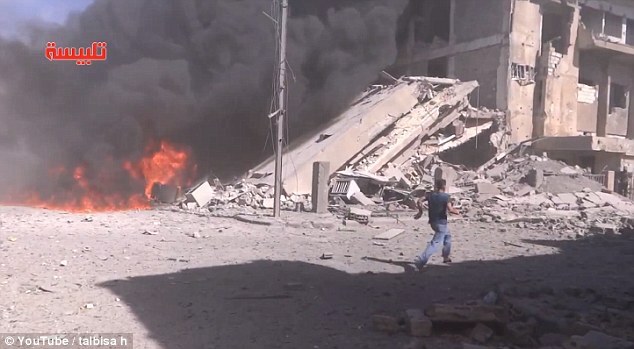 ‘The Russians struck northern Homs today and killed 36 innocent people… who fought against extremism,’ said Khaled Khoja, head of the National Coalition. Western powers consider Assad’s military responsible for the vast majority of the 240,000 deaths in the war, and say his presence makes a political settlement impossible. Russia, meanwhile, is urging countries to join an intelligence task force Moscow is setting up with Iran, Iraq and Syria, arguing that supporting Assad’s government is the only way to defeat ISIS. Putin, who obtained parliamentary permission to use force abroad just hours before the strikes, warned that Moscow would hunt down IS militants before they target Russia. He pledged his country would not get sucked into a protracted military campaign and chief of staff Sergei Ivanov said the operation would be time-limited and not involve ground forces. NATO Secretary General Jens Stoltenberg expressed consternation. ‘I’m especially concerned because there has been no real effort by the Russian side to de-conflict the Russian air strikes in Syria,’ he said, referring to the limited advance warning. Putin wants to muscle his way back onto the world stage after months of Western isolation following Russia’s seizure of Crimea and support for a separatist insurgency in eastern Ukraine. 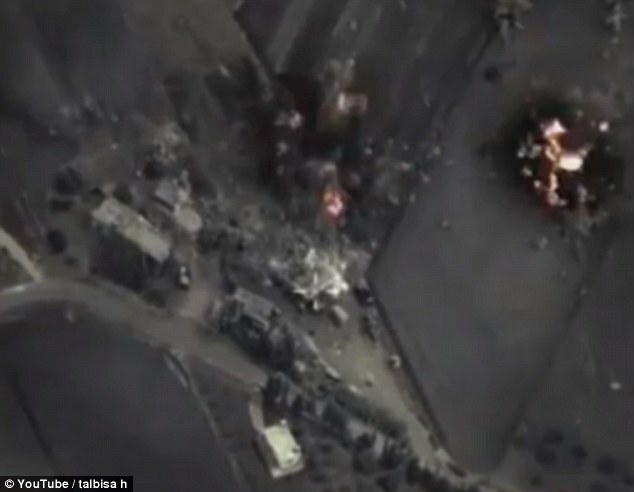 Russia’s powerful Orthodox Church voiced support for Moscow’s air strikes, calling it a ‘holy battle,’ but some in Russia dared to accuse the Kremlin of short-sightedness. Alexander Konovalov of the Strategic Analysis Institute said Russia wanted to end its diplomatic isolation and may not realise the long-term consequences of intervention in the Middle East. ‘We were going to Afghanistan for six months and stayed there for 10 years,’ he told AFP, referring to a conflict that killed over 14,000 Soviet troops between 1979 and 1989. Sixty-nine percent of Russians are against Moscow’s deployment of troops in Syria, with just 14 percent in favour, according to a recent poll by the Levada Centre.